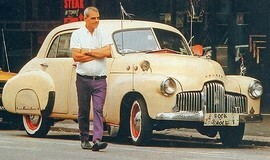 The Brisbane man who drove his much beloved 1952 FX Holden up and down the length of Queen Street, who danced in winklepickers at the original Cloudland and earned himself the nickname “Rock ‘n’ Roll George”, has died aged 82. George was an iconic image of Brisbane’s days of bodgees and widgees, dancing at Cloudland, of cruising in cars for girls, of milk bars, cafes, of New Farm and South’s Rugby League. The iconic FX Holden car is 57 years old and (the rock `n’ roll plate) has probably been on the car for 54 or 55 years. He loved his car, loved cruising around and loved talking to people. Every afternoon he would catch the bus into the city. He’d stay there for an hour, or an hour and a half, just talking to people he had met.